Accounting operates on either a cash basis and an accrual basis—you count money when the check hits the bank, or you set up for payoffs you expect to come in later. Television operates simultaneously with both. Over the course of an episode, the show sets up short-term satisfaction (say, a procedural plot that resolves with the killer being found) and plays with the balance of the season, the series, the characters. That accrual is the long-term work of the show; it earns loyal viewers, keeps us invested in the slow-burn narratives, and pays off whenever a long-building plot bubbles over/two characters are finally brought to loggerheads/a season-long pattern is confirmed. Two episodes ago, Shinwell died to give Joan something that would tip her into open conflict with Sherlock. Viewed on accrual, it’s not clear if this ever paid off. (Joan seeking justice and revenge simultaneously is satisfying; prompting it via a character who always felt like a walking setup for murder is…less so.) And nothing in the nuts and bolts of this episode resolves any lingering issues of this arc; the racist undertones of the fallout are still here, and Shinwell’s death is very clearly a mechanism to give Joan a reason to Demand Answers from behind Gregson’s desk. But most importantly, this is the episode when the long-simmering tension between Joan and Sherlock comes due, and gives us the arguments we’ve been waiting all season to see. Not this time, though. This time, a whole season of vague, subsumed tension finally snaps, and they get to fight, and fight, and fight. Some of it feels like Joan unconsciously unloading some unasked questions two seasons running: “Are you using again?” she demands—something she hasn’t asked in a very long time, and that couldn’t be better calibrated to strike Sherlock where he’s most vulnerable and defensive. (Snapping about whether she’ll allow him to leave for a while is the kind of thing he pulled when she was his sober companion.) She asks him to go with her to Shinwell’s memorial—one of the few times she’s ever dropped the assumption of hyper-competence and baldly asked for support. When Sherlock doesn’t turn up, she unleashes anger that feels like years in the making. And because we know what she doesn’t, this sails past Joan merely having her belated say and becomes something else—something that both pays off a short-term mystery, and starts drawing on things that will need to eventually be answered. Director John Polson frames the opening volley of this argument as deeply off-balance, and fundamentally about two people who can’t see what the other really needs. Joan’s swamping the frame, staring at the video evidence in a near-Holmesian fury; well behind her, Sherlock (visually hemmed in by the door frame) shrinks in on himself, hands shoved in his pockets, waiting for her anger to inevitably bubble over. We know the sting Joan felt, seeing she was the sole mourner Shinwell’s memorial; her unresolved ambivalence about Shinwell, and her righteous anger at Sherlock for her own sake and for Shinwell’s, are justified. She’s forgiven a thousand cuts, and it’s no wonder she’s furious now. “I forgot,” coming from Sherlock, is an insult. Or would be, except we know that Sherlock thinks he’s losing his mind—the sort of horror that consumes—and he genuinely did forget. (I don’t necessarily buy how swiftly this overtook him, but Jonny Lee Miller plays the hell out of it, so.) He’s terrified of himself; the tremble underneath his voice is practically begging Joan to understand him without him having to say so, the way she’s understood him before, a thousand times. But for once, Joan’s too angry to notice; if she does notice, she’s too angry to care. Each of them has a completely defensible emotional position, articulated precisely the wrong way to be understood, at a time when everything around them is falling apart. The reason each of them has come back to this partnership, at different times, is because it was such a comforting animal. There’s always someone to turn to, someone to look over your work, someone to share the comforts of a nice domestic spat about what you’re going to do with the chickens. (Or the murder-scene recreation, the musical instruments, the other murder-scene recreation…) Even their bigger fights have, eventually, built onto their foundations. But they’ve never had a fight like this one, where the lack of communication is so fundamental that there’s no way to meet in the middle. Sherlock has to pay for a season of dismissing Shinwell by being dismissed himself; Joan pays for a season of guilt and uncertainty by finally laying down the law to someone who’s using defensiveness to cover his terror. They’re alone, by turns, in their lowest moments. And when Sherlock’s finally frightened into going to see a doctor, he doesn’t ask Joan to go with him; she might not say yes, and it’s a fight he just can’t risk. 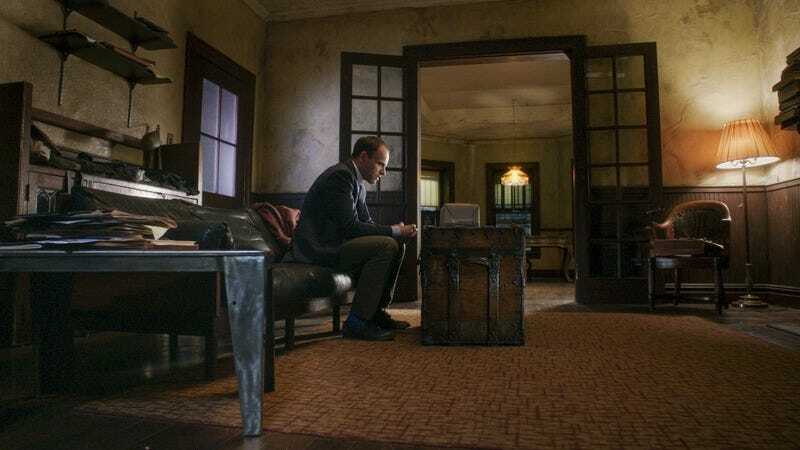 The season ends on that cliffhanger (not immediate peril, but certainly if they hadn’t been renewed for a sixth season there would have been frantic questions from fans). And a lot can happen between seasons. Honestly, it’s entirely possible next season will forget all of this except Sherlock’s sadness—Joan will be quietly sympathetic, and all this will be eaten by the narrative. But I hope not. For the first time in a while, the show seems to understand the depth of its emotional debt; it’s pulled in so much old hurt for these fights that there’s no easy solution. Sherlock’s been lying to Joan, Joan’s lack of trust manifested in asking the worst possible question of Sherlock, and each of them has, in their own way, abandoned the other. She could show up at the hospital five minutes after he goes in, and they could both apologize, and it still wouldn’t solve the problem; we don’t know where they go from here. That could turn out to be great news. Let’s see next season. Though the network initially tried to lean into the quirk factor of the show in the Sherlock Holmes canon, by and large CBS has given Elementary the same treatment as many of its other steady, unremarkable shows: More interested in reassuring than hooking viewers. That said, their vague declarations can be kind of hilarious. The promo before this episode announced Holmes & Watson: A Perfect Match, which one can pretend contains a DNA reference as well as a blatant tip-off about how badly Sherlock and Joan were going to spiral out. Miller’s increasing agitation about the memory boxes was great, lending those beats an atmosphere of dread even if you already suspected what the matter was. It’s been an odd season, but if they take this level of character work into account going forward, there will be a lot to look forward to in this renewal. Thanks so much to everyone for reading!